With a growing collection of small satellites from academic, government, arts, military, and corporate sectors, Interorbital Systems (IOS) is rapidly filling the manifests for the first two of its 2011 launches, and booking a series of dedicated orbital missions well into 2012. Interorbital Systems, with headquarters, manufacturing, and test facilities based at Californias Mojave Air and Spaceport since 1996, is building a dedicated small satellite launch vehicle, and the small satellite kits that rocket will lift. The launcher under construction is the NEPTUNE 45 (N45), a modular rocket system, built of standard, identical modules called Common Propulsion Modules (CPMs) as they are common to the design of all IOS space launch vehicles. N45, a seven CPM-bundle rocket, will carry some 30-40 co-manifested picosats to a 310-km circular polar orbit on its 2011 maiden flight, and a lift a single 45 kg satellite on a scheduled 630-km follow-on single satellite launch for later in the year. Interorbitals totally modular rocket system can morph from a single, stand-alone CPM sounding rocket for suborbital research, into a vehicle capable of carrying a 30-kg payload to LEO (the 5-module NEPTUNE 30 (N30), into a 37-module lunar-capable N1000 (1000kg to LEO), or into any other rocket variant built with the exact number of modules needed meet the requirements of a specific mission. First introduced in 2009, the N30 launcher quickly sold-out it payload capacity. Due to the growing demand for payload space, Interorbital decided to enhance the launcher by adding two additional modules to create the N45 (45 kg to orbit). This transformation increased the rockets payload capacity to 30 of IOS cylindrical TubeSats, and 10 conventional CubeSats. Over a decade of internal R&D, prototyping, and testing resulted in the refinement of IOS NEPTUNE- series rockets and the introduction the TubeSat Personal Satellite Kit. The development of these expandable modular rockets is the companys first step to LEO, and the beginning of what Interorbital has charted as a program that will encompass human space flight, the development of an Earth-Moon transportation system, and the establishment of a permanently inhabited Lunar Base, IOS President/Chief Technology Officer Roderick Milliron stated. The current manifest for Interorbitals inaugural launch (second quarter of 2011) include CubeSats from UC Irvine; EuroLuna (2U Romit-1 from Denmarks Google Lunar X PRIZE (GLXP) Team); and Universidad de Puerto Rico teaming with Marcelino Canino Canino Middle School; and TubeSats from Morehead State University (Kentucky Space); InterAmerican University of Puerto Rico; University of Sydney (Australia); Aslan Academy (Private Los Angeles High School); Project Calliope (Space Music Project); GLXP Teams Stellar and SYNERGY MOON; Naval Postgraduate School (3) (communication with live remote exercises); Defense Science and Technology Lab (DSTL,UK); Austrian Arts Group mur.at; United States Military Academy at West Point (2); Brazilian Space Agency/ 120 Fifth Grade Students Ubatuba Elementary School; and GLXP Part-Time Scientists/Fluid & Reason. All satellites on the first launch will be placed in a 310-km self-decaying orbit for an active lifespan of between 3 weeks and 3 months, depending upon solar activity. The TubeSats will gradually deorbit, re-enter Earths atmosphere and burn up, thus eliminating orbital debris. Interorbital originally created the $8,000 Personal Satellite Kit and Launch to serve the academic community and the small business space entrepreneur. As an academic tool to stimulate STEM programs, TubeSats are already part of the curriculum in universities and schools (Morehead State, Aslan Academy) around the world. Perhaps the most ambitious is the Brazilian program run by Candido Osvaldo and Emerson Yaegashi which has 120 fifth-grade students creating 22 full-scale TubeSat mockups in the classroom. The students who build the best mock-up win the honor of assembling the actual orbital TubeSat. Interorbital is being bombarded with requests for customized missions  largely due to its low-cost and its aggressive launch-on-demand schedule, which includes both ocean-based and land-based launches, all under US license, and all for between $8,000 (Basic TubeSat Kit and Launch) and $384,000 (for a full 45-kg payload dedicated launch). In January, Interorbital will introduce a standard CubeSat Kit and Launch Package for the academic price of $15,000. The IOS CubeSat Kit includes the same thoroughly tested electronics hardware as the TubeSat, and a CubeSat chassis, more surface area for solar cell installation, two free sides for experimenters use, a roomy central space plus two endplates for experiments or applications. Two sets of milestones must be met before the first orbital launch: conducting three low-altitude suborbital launches of a single CPM to test various systems in flight, and the completion of all regulatory requirements including launch license, export compliance requirements, ITAR issues, etc. The first low-altitude (35,000-50,000-ft) flight tests will lift off from the Pacific Rocket Society launch zone at the Mojave Test Area near Koehn Dry Lake, in California, under a Class 3 Rocket waiver granted by the FAA. In preparation for the first of these flights, Interorbitals launch team recently performed a lift test with its 30-ft mobile launcher and the CPM flight test vehicle. Two groups will fly payloads on the suborbital flights  Alex Bordetskys teams from Naval Postgraduate School and Bob Twiggs team from Morehead State University  both testing equipment that will be used on their orbital flights. The N45 is comprised of sevemn CPMs (NEPTUNE 45: throw weight of 45kg to a 310km Polar orbit). Each CPM is also a stand-alone sounding rockets capable of lifting 145 kg to 310km in a ballistic trajectory; price: $115,000 for rocket and launch services; exclusive of range and transportation costs. Recent entrants to the space launch industry tout vertical integration as a key factor in driving down costs and offsetting scarcity of supply chain options. As an operational philosophy, Interorbital has taken one step further by challenging end-to-end assumptions of rocket design and space launch operations. IOS draws on concepts from the minimum cost design (MCD), such as minimizing use of highly skilled labor, using identical components suited for mass production (the CPMs), using a private launch range, and choosing technology which is scalable with low incremental cost, constructing and propelling its launchers with non-exotic, industrially available materials, and manufacturing all key rocket components in-house. Interorbitals philosophy is ideally suited to the establishment of a dedicated nanolaunch service since the manufacturing and performance goals are relatively modest when compared to more demanding space missions such as flagship space probes, heavy lift, or human space flight  all of which are part of IOS long-term goals. These more ambitious programs will be made possible through the short-term implementation of the companys new small sat launch service. This approach to space launch also carries over into a complementary business segment through Interorbitals offering of the TubeSat picosatellite kit. The CubeSat, established by Professors Bob Twiggs and Jordi Puig-Suari, has been a phenomenal success, even described as a disruptive technology. However, a typical CubeSat may cost close to $100K to develop, placing it out reach of small colleges, secondary schools, and for that matter, average citizens. The TubeSat, on the other hand, like the ultra low-cost launch vehicle it rides, prices out into what is essentially a bargain-basement, fully functional picosatellite. Its design is simple  it is constructed completely of circuit boards  there is no shell, other than an alternating series of aluminum strips (for thermal control) and solar cell PCBs (printed circuit boards), which form the satellites structure. All kit components are commercial-of-the-shelf. 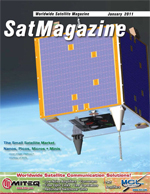 Since Interorbital considers all TubeSats primary payloads, mechanical and electrical isolation requirements are greatly reduced, eliminating costly deployment hardware, and allowing passage to orbit for more adventurous experiments that would not be permitted to ride along as secondary payloads on larger standard, more expensive, or more sensitive missions. After many years of searching the worlds existing spaceports for an affordable launch location, IOS principals realized that the only way to provide low-cost commercial spacelift was to go outside the system and work to create a spaceport of its own. Private spaceports, whether land-based or sea-based, are a key component in driving down launch costs. We have always had an amphibious agenda, says CEO Milliron. Our goals include establishing a spaceport in the friendly South Pacific Kingdom of Tonga that would support our orbital expedition/space tourism and lunar launch programs. After all regulatory hurdles are cleared and flight tests have been completed, Interorbital Systems will conduct its first orbital launch from one of its private launch locations. Its current target window for launch is the end of the second quarter, 2011.